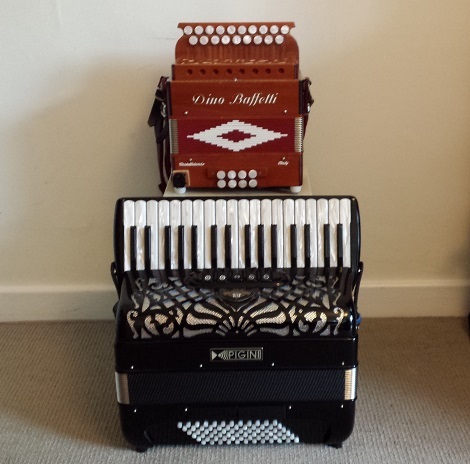 A secondary objective is to provide occasional accordion and/or melodeon related Articles , the first two of which are a look at My Current Instruments and Comparing Aspects of Accordion and Melodeon. There is information about my music background on the About me page. The blog is mostly about piano accordion and DG melodeon, but Continental Button Accordion (CBA) does get a mention. I have preceded all the links to tune-sets with either (A), (M) or (A) (M) so if, say, you only want to look at melodeon recordings then only click on links including an (M). I got the blog up and running on 30 March 2018 with 17 new videos and 28 videos from the past few years. My intention is to add new recordings and the occasional article on an ad-hoc basis, hopefully every few weeks. You may find the Links page of some use, and you can Contact me here. * I strive to make my music lively, expressive and rhythmic and to find interesting tunes and combinations. I hope that comes across in the recordings and compensates for my rather rudimentary recording and editing skills, occasional fluffed notes and playing head down so often (I never had a teacher to beat this out of me).